Would your kids enjoy crawling, squeezing, and sliding through castles of ice? Can you envision your little ones channeling Elsa from Frozen and singing “Let it Go?” Ice Castles, a giant installation of ice mountains, caves and slides, offers families a magical way to get out and enjoy winter. My family visited Ice Castles in Midway, Utah, and we were in awe. At the entrance, we were greeted by a beautiful frozen fountain and walls of ice. Wandering around, we discovered narrow walkways winding through gorgeous walls of ice, tunnels to crawl through, and slides for big and little kids alike. My favorite feature of the Midway Ice Castles was the dome room. While most of the castles were very tall walls of ice, the dome room walls were even taller and curved inward into a dome that draws oohs and aahs from everyone who strolls inside. We weren’t completely enclosed, but it felt like we were. The kids were big fans of the giant ice slide. There were also some tiny slides for the littlest Ice Castle explorers! The idea for Ice Castles came from Brent Christensen who was building an ice cave for his daughter in his front yard in Utah. Designers manually place 10,000 icicles every night to create the framework and guide the direction they want they the castles to grow. Then they rain water on the installation for hours to allow the castles to freeze and grow. The average ice castle is 25,000,000 pounds. Dress warm. You will need a warm coat, hat, gloves and preferably snow pants. If you want to go down the ice slide – snow pants are the best. You won’t get wet, but jeans and cotton pants will slow you down. I watched lots of people pushing themselves down the slide because their jeans slowed them to a stop. Snow pants will really let you slide! Visit at night. Ice Castles is stunning any time, but I highly recommend visiting at night when it shines with multi-colored lights. Wear boots. You won’t find any rock salt or clear paths in the Castles. You’ll be walking on crushed snow and ice which is often unstable. Appropriate footwear is important for safety and for warmth. Get there early. You purchase tickets for a 1/2 hour time window, but you can stay as long as you want to explore. Arrive at least 15 minutes early to leave time to park, sign a waiver and get in during your time window. 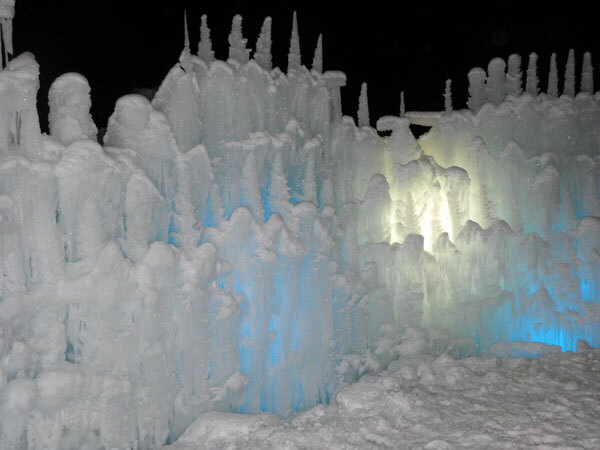 Ice Castles moves to different locations each year. This year, you can find them in Midway, UT, Eden Prairie, MN, Lincoln, NH, and Edmonton, Alberta, Canada. When you want to warm up, the snack bar offers hot cocoa, water, warm cinnamon rolls, and sugar cookies, and there is a gift shop on your way out. Plan to spend at least an hour enjoying the magic.